VR gaming is such a high-octane fat burning, muscle flexing exercise that fit gamers like Dusty Fohs lost 20 pounds and Oldboy67 shed 12 pounds in as little as 2 months! Virtual reality can gamify your exercise routine and it doesn’t have an age cap or fitness level entry requirement. You, yes you, can jump right in! If you want to see results in how your clothes fit, building endurance and muscle, or are on a journey to shed your winter hibernation bod, you must add these 15 VR fitness games to your workout regimen. Keep a towel and water bottle nearby! And wear a smartwatch to track your heart rate and workout data! Box VR players punch to the beat and get their sweat on while listening to the heart-thumping rhythm of electronica. This is a VR game that is great for conditioning the arms, shoulders, and chest while getting some sweat dripping cardio in. The game doesn’t just make you box your way to fitness, it will count how many calories were destroyed during a workout. Box VR is an Oculus Rift, HTC Vive, and Windows Mixed Reality game. It has an Oculus comfort rating of “Intense” and has earned 3 VR Fitness Insider – VR Fitness Awards! Beat Saber is a rhythm-based cube slicing and obstacle weaving VR game that’s going to set your fitness tracker on fire. Players match their neon red and blue sabers to the corresponding cubes as they are moving down the illuminated platform. They then slice towards the direction of the arrow. There are 11 original songs and beat maps with more on the way for PS VR and also PC. PC Players online have modded popular songs and beat maps into the game for a custom workout. Beat Saber is an Oculus Rift, HTC Vive, Windows Mixed Reality, and PS VR game. It has a fitness rating comparable to Tennis by VR Institute of Health and Exercise! Knockout League is an active VR boxing title that will have you punching your way towards a serious sweat session. You’ll be fighting 9 opponents, earning Golden Gloves, and will get a cardio and conditioning workout at the same time. Playing Grudge Match, Reflex Alley, Focus Mitt Training, and Speed Bag will give you hours of full body exercise. Utilize room scale and move around with your opponent as you punch and weave to fire up the fat burn! Knockout League is available for HTC Vive, Oculus Rift, Windows Mixed Reality, and PlayStation VR. It has a VR Institute of Health and Exercise rating that’s comparable to rowing. The Thrill of the Fight is one of the VR boxing simulation games that Tim Donahey played during his 50 Day VR Fitness Challenge. 20 minutes in this punch em’ out game pushed his upper body to its limits while keeping the gloves up and turning to block noticeably worked his obliques and abs. It’s rated by the VR Institute of Health and Exercise as being equal to sprinting. The Thrill of the Fight is an Oculus Rift and HTC Vive release and has won a VR Fitness Award for Best VR Sports Sim. Sprint Vector is a competitive VR game that will have players shuffling their arms like a futuristic speed skater around 12 fun and exciting track maps. Pump the arms rapidly to move faster in the game, watch for oncoming obstacles, level up speed boosts and unlock projectiles to fling at competitors. This is a dominant upper body game that will rely on the lower body to stabilize and anchor players as they race around frantically. Sprint Vector is a game for the Oculus Rift, HTC Vive, and PlayStation VR, and took home a VR Fitness Award for Best VR Arm Workout. Sparc is the closest you can get to virtual dodgeball, with 2 balls being thrown, blocked, and bouncing around — yours and your competitors — equipped with only a shield and Patches O’Houlihan level dodging abilities. This rapid-fire competitive game is a great blend of upper and lower body conditioning that’s fun to play with a friend you have a bet with. Sparc is an HTC Vive, Oculus Rift, and PlayStation VR game that’s earned a VR Fitness Award for Best VR Competitive Fitness Game. Sword Master VR is a first-person combat game that will have players slicing enemy fighters with a sword and blocking with a shield. Using the sword to hack away at bad guys is going to be great for the upper body. Using the shield won’t give players much lower body conditioning, but squatting or lunging to get out of the way will! VR Institute of Health and Exercise rates Sword Master as the equivalent to using the elliptical machine at the gym! Sword Master VR is an HTC Vive and Oculus Rift game and has earned a VR Fitness Award for Best VR Fighting Fitness Game. Superhot VR is a first-person shooter where players sucker punch, maim, and shoot red polygonal humanoids. Players can slow down time, which will target the core and legs from slow-mo dodging away from bullets, while the upper body will get the height of the action during hand to hand combat. VR Institute of Health and Exercise rates Superhot as the equivalent to walking at a moderate pace. Superhot VR is an Oculus Rift, HTC Vive, and PlayStation VR game that took home a VR Fitness Award for Best VR Shooting Fitness Game. Audioshield is a high-energy and music driven (add your own!) VR game that will dial up a player’s fat burn up to 11. Players punch, block, and coordinate their colored controllers to the beat orbs flying towards them at varying speeds, combos, and locations. Defending yourself from the orbs is an effective upper body exercise, while holding a squat or lunge as you hit can amp up the difficulty on your lower half. Virtual Reality Institute of Health and Exercise rates Audioshield as being equal to working out on a rowing machine or cycling (with the mod)! Audioshield is available for HTC Vive, Oculus Rift, and Windows Mixed Reality headsets. Holopoint is a first person, bow and arrow shooter, where players will be slinging arrows at tough blue holographic samurais, demons, and targets that shoot back. Players compare the gameplay to training in the Hunger Games with dominant upper body use and lower body anchoring. Playing Holopoint with one dominant arm is going to make for an uneven workout, so this is a good addition to an exercise lineup, rather than the main event. Virtual Reality Institute of Health and Exercise rates this game with an intensity level that rivals swimming laps. Holopoint is available for the HTC Vive and Oculus Rift headsets. Hot Squat is a challenging drop it like it’s hot VR game that will make any booty firm with consistent gameplay. This is an easy entry-level workout that will be a great first time VR fitness experience but can also be a great addition to any gym rat’s leg and glute day roundup with extra help from a weighted vest. Stand and squat through the virtual obstacles and hold the squat until you make it to the other side! Virtual Reality Institute of Health and Exercise rates it as equal to the intensity level of playing tennis. Hot Squat can be played on the HTC Vive only. The Fastest Fist is a boxing simulation game that will have you sparring against a trainer that looks exactly like Bruce Lee. Players will be shadowboxing for a warm-up and then punching dynamically the rest of the rounds with various jabs, hooks, and other punches which is great upper body conditioning. Blocking makes you lose points and won’t be effective for your lower body, but dodging will do the trick and will get you more points. Virtual Reality Institute of Health and Exercise compares this game to playing tennis. Soundboxing is a punch to the beat, music-driven VR game that will kick-start a player’s fat burn with energized music. Players coordinate punches using their controllers to accurately hit the beat orbs flying towards them at varying speeds and combinations. Create your own beat maps to go along with your favorite workout playlist by uploading them for a more enjoyable workout. Punching directional orbs with some extra effort behind punches is going to be an effective upper body exercise, while holding a squat or lunge as you hit will fire up the difficulty on your lower body. Soundboxing is available for HTC Vive and Oculus Rift headsets. Bitslap is a cardio heavy, High Intensity Interval Training (HIIT) workout in VR. Players will hit cubes in a sequence as more cubes spawn and create havoc. Punching and hitting cubes in the order they appear is important to maintain score. The game uses punching intervals that rival Tabata, which will work the upper body, while reaching and squatting in a wide stance for lower cube patterns will target your lower body. Virtual Reality Institute of Health and Exercise rates it on the same energy output as working out on an elliptical. 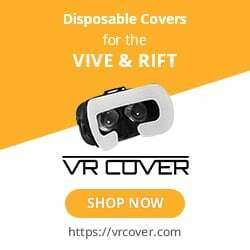 Bitslap is compatible with the HTC Vive headset. Gorn is a combat VR game that will have players brawling and using weapons like a spear, sword, and war hammer to take out enemies like honey badgers or warriors as they attack. Play in endless mode to ramp up the intensity of this dominant upper body game. This is not a lower body game but you can still work out the lower body with squatting and dodging to help you escape getting your head knocked off. Virtual reality Institute of Health and Exercise have rated this game as equal to working out on the elliptical. Gorn is compatible with the HTC Vive and Oculus Rift. Did you add any of these VR fitness games to your workout? Which ones did you like the best/least? Did we miss any VR fitness games? Let us know in the comments!